Las Vegas is a city in Nevada USA that is world famous for casinos and gambling. Aside from gambling, it's a city known for flashy shows, luxury hotels, entertainment, and of course it has the nickname sin city. It feels strange explaining Las Vegas since it is such a well-known city. Even if you haven't been there before you've probably watched a TV show or movie where they go to Vegas. Why You Should Go: Obviously Vegas is the place to go if you like to gamble but there is also a lot of other stuff to draw you there. Entertainment is everywhere. Even just walking around is interesting because of all the flashing lights and the themed hotels. Some of the hotels are really classy, some are corny as hell and others are retro to the max but it's all fun to see. Every day there are musicians, magicians, comedians, Cirque du Soliel acrobats, and many more performances. It's also really cheap to stay in Vegas since they want to get you there to spend all your money! Getting to Las Vegas: You can drive there if you live close enough to do that. Driving from LA to Vegas sounds like a fun drive through the desert. You can fly into LAS airport. It's well connected to the city. You can even catch the bus there. For example, you can get a bus from LA to Las Vegas. How vegan-friendly is it? We found Las Vegas to be a lot more vegan-friendly than we ever expected. It is especially Vegas friendly in Downtown Las Vegas it seems. There are a few restaurants on the Strip that have vegan options but the strip is so huge that the vegan-friendly places are more spread out than downtown. Downtown all the vegan options are more concentrated. There are also some vegan places in other parts of the city. Vegenation: This is an all vegan restaurant with all sorts of different styles of food from Vietnamese Pho to Tacos to Chicken and Waffles (Vegan). Nacho Daddy: This is a restaurant/bar that specializes in Nachos and they have a vegan menu. Their nachos are delicious with housemade vegan cheese and vegan sour cream! The choco cake was fantastic too! To die for you might say. They have 3 locations, one downtown, one on the strip and one is a part of Vegas you probably won't go to as a tourist. Market: It's literally a market where you can buy food but they have a cafe with tables so you can get all sorts of brunch food there. There have a number of vegan options on their menu with enough choices to keep you coming back. 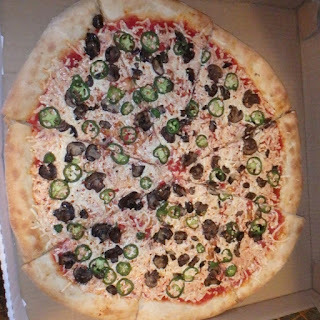 Evil Pie: They have vegan cheese and you can custom order a pizza with vegan cheese. The vegan option they had for their pizza by the slice case had no cheese on it and you have the option to add vegan cheese to it. We went for the full pizza and we were very impressed with the size and the delicious crust the pizza has. 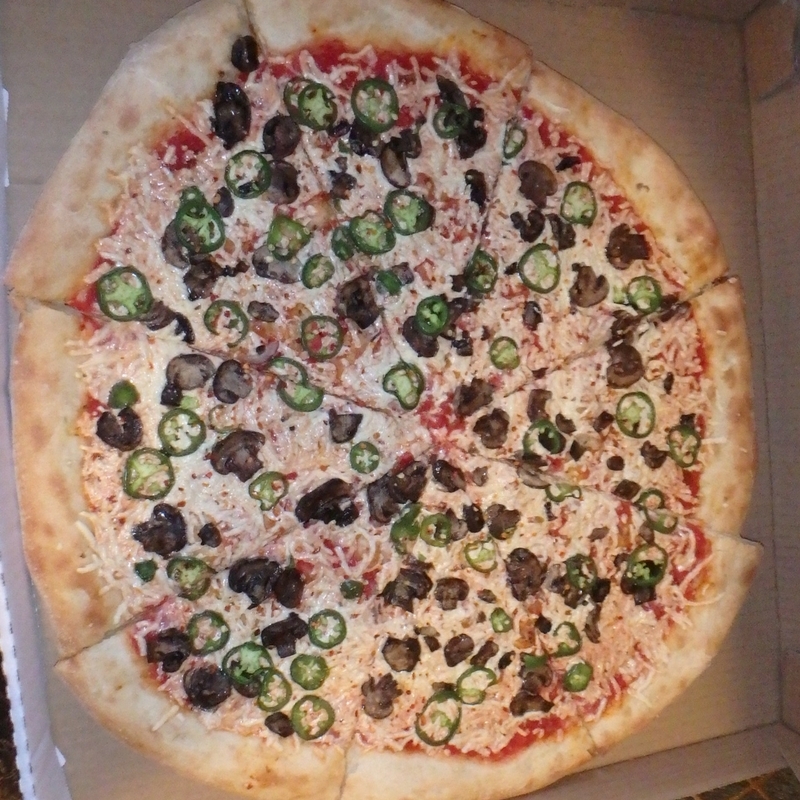 We'd recommend vegan cheese, jalapenos and mushrooms for your toppings. Flippin' Good: The vegan chicken burger is the only vegan thing on the menu but we thought it was definitely worth getting. It's all about the breading and the breading on this is amazing. Donut Bar: Holy smokes these donuts are awesome. Get there early as the vegan ones seem to sell out quickly. We got one of each of the ones they had that day but they are always switching it up. Hussongs Mexican Cantina: This place had a vegan happy hour when we went there during Veganuary which meant that all the vegan options were on special. There was lots of choice of tacos, quesadilla, nachos and even delicious roasted corn! It was just what the doctor ordered and all vegan! Jaburritos: This is a casual restaurant with sushi burritos and other food that is a fusion between Japanese and Mexican food. It's not a vegan place but has decent vegan options. You can get your burrito in a nori wrap or a tortilla wrap. There are lots of different Japanese and Mexican dishes on the menu. This seems like a unique combination but surprisingly there were a few other places with a Japanese and Latin American fusion like Sushi Samba for example. Sprinkles: This is also not a vegan place but they do have a great tasting Vegan red velvet cupcake. It is expensive but they give you a receipt with a 2for1 coupon on it so you come back for more. They also have a cupcake ATM machine. Yes, that's right, an atm machine that dispenses cupcakes! White Castle: They have the Impossible Foods burger patty at White Castle now. It's the most authentically meat tasting vegan burger patty out there. It is more realistic than the Beyond Meat Burger which is saying something. This is either a good or bad thing depending on your perspective. It is strange what food science can do these days. Anyway, we had heard that their regular veggie sliders were vegan as well but the staff there seemed to be confused about that. The Impossible Slider is definitely vegan though. Pop-up Pizza: They had a Veganuary special which was cool and they sell pizza by the slice. You can order a whole pizza too of course. Flour & Barley: They have a vegan option with Daiya cheese. This is a thin crust Italian style pizza where they cook the pizza in one of those big brick ovens which nice. This pizza is made fast. Yard House: This is a restaurant that specializes in having a massive selection of different beers which you can get in a big yard glass. They also happen to have a bunch of vegan options such as burgers. They use the Gardein burger patties. They can't guarantee no cross contamination and their fries are not cooked in a separate fryer from anything else. A.Y.C.E: Most buffets in Las Vegas don't have much in the way of vegan food but this one in the Palms had quite a bit. The chef will take you around and show you the different options available to vegans. There were all sorts of veggies, tofu, salad, chilli and more when we were there. They even had a vegan brownie for dessert. 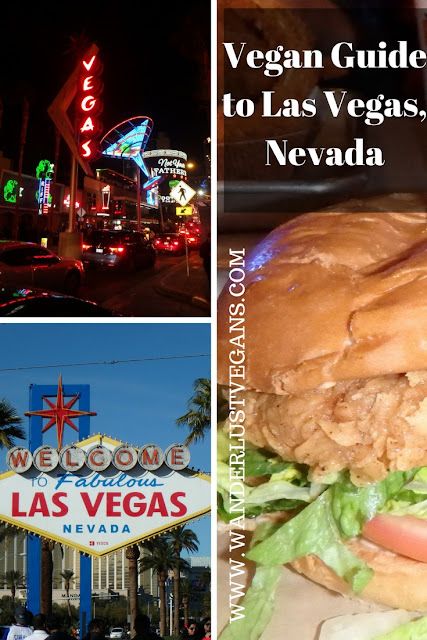 For more vegan options in Las Vegas check out the Vegans, Baby which is a Las Vegas focussed vegan blog with a lot of great information. She literally wrote the book on eating vegan in Las Vegas. Otherwise, you can check out the old standby Happy Cow which has a list of vegan, vegetarian and veg-friendly places to eat. Happy Cow states that Las Vegas has 21 fully vegan places, 3 vegetarian and 120 veg-friendly restaurants. You're bound to find lots of great food while visiting. Sight-Seeing: Go to the Las Vegas strip to see all the famous hotels like the Bellagio, check out Penn and Teller for a magic show, see a Cirque du Soliel show, watch the Blue Man Group or hang out in downtown Las Vegas to see the Fremont Street Experience and tons of street performers. You can also go for a ride up the Stratosphere to see the best view of the city. Where to stay: If you are staying in downtown Las Vegas at one of the many retro hotels we liked the El Cortez. We picked El Cortez for the price, close proximity to vegan restaurants and because we like the downtown Las Vegas atmosphere. There are many hotels to choose from so check out the reviews before you pick and make sure the hotel is right for you. The Plaza Hotel & Casino might be another good choice downtown since that is where Pop Up Pizza is located. Another great place to stay is The Linq which is on the strip and has quite a few places nearby with vegan options. The great thing about The Linq is the shopping promenade and also the rooms were new and clean. Have you been to Las Vegas before? What is your favourite thing to see? Did you know it was this vegan-friendly?